Comm Eye Health Vol. 31 No. 101 2018 pp S25-S26. Published online 11 July 2018. National ROP guidelines, database for monitoring, evidence-based policy making, and provision of infrastructure and equipment are critical to prevent a ROP epidemic in Bangladesh. 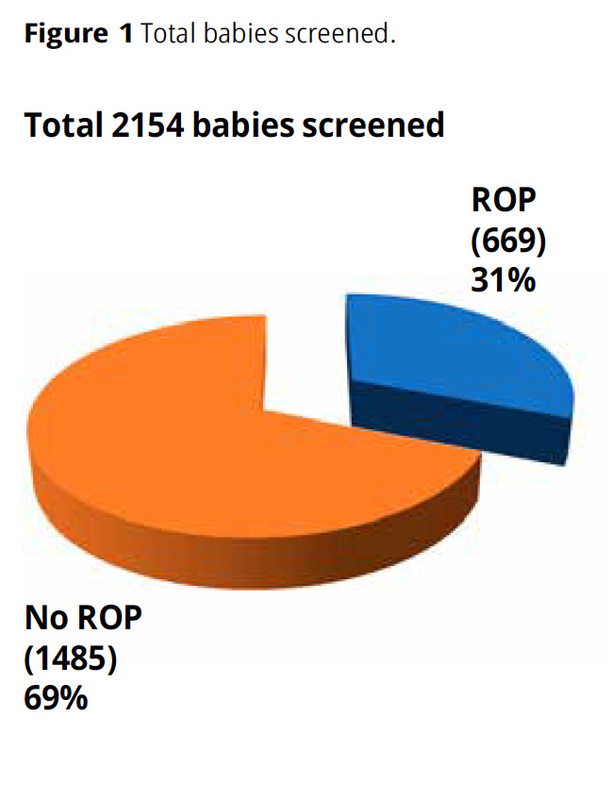 One of the earlier studies for ROP in Bangladesh included preterm infants of gestational age <33 weeks between December 1998–July 2003, and found an incidence of 5.5% (five babies) in 114 babies, all presenting at various stages.3 Another study assessed the presence of ROP and potential risk factors other than supplementary oxygen in premature infants ≤34 wks and or ≤1500g, and detected ROP in 40% of cases (23 out of 58).4 Before 2010, screening for ROP was almost non-existent. 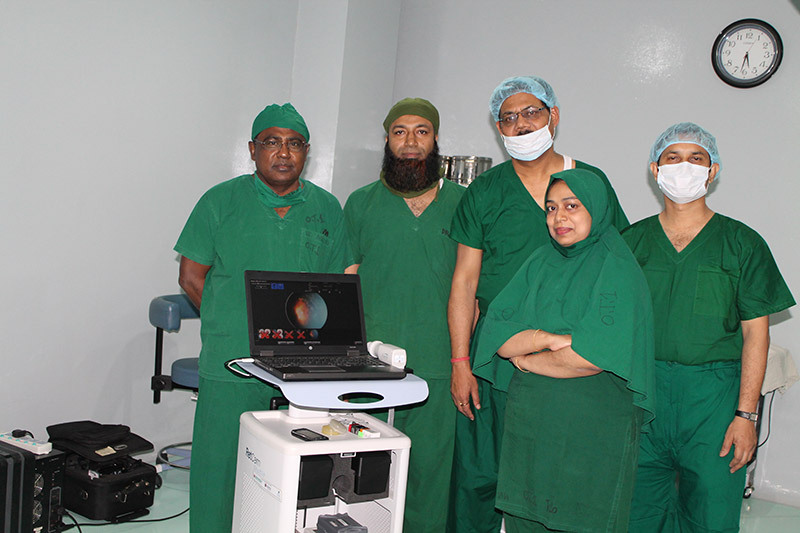 Between 2010 and 2012, basic services were available for screening and laser treatment in only two centres, namely the Ispahani Islamia Eye Institute and Hospital (IIEI&H), and National Institute of Ophthalmology (NIO) in Dhaka. Only 55 babies were examined during this period at IIEI&H, of which 30% required laser treatment. Seven babies at presentation had stage V ROP, with total retinal detachment, which carries an extremely poor visual prognosis. In 2013, ORBIS International in collaboration with IIEI&H organised a stakeholders’ awareness and sensitisation programme for neonatologists and other personnel. This support from ORBIS included human resources development, infrastructure and equipment. The goal of the collaboration was to ensure that no premature baby would be left out of the screening net in the NICUs of Dhaka within the next five years. Through this programme, three retina specialists were trained in ROP at the LV Prasad Eye Institute (LVPEI) in India. ORBIS also supported the training of a ROP programme manager and technicians. The ROP programme manager is responsible for communication between the NICUs and ROP team of IIEI&H. According to a protocol, the ROP team visits NICUs to screen and treat babies before discharge. This collaboration has led to an increase in the number of babies screened. It has also reduced the proportion of babies with blinding ROP at presentation. Currently, there are 20 NICUs in Dhaka and only three are government owned. In a survey carried out by ORBIS in 2014 at 12 NICUs of Dhaka, 2962 preterm infants were managed over a six-month period in 2014. IIEI&H screens ROP babies who are referred to the hospital from the NICU centers, and additionally performs on-site screening at three NICUs. At IIEI&H, babies with gestational age of less than 35 weeks and/ or birth weight (BW) of less than 2000g are screened. Babies outside these criteria adjudged to be at risk of ROP by the neonatologist are also screened. About a third of these babies had different stages of ROP. 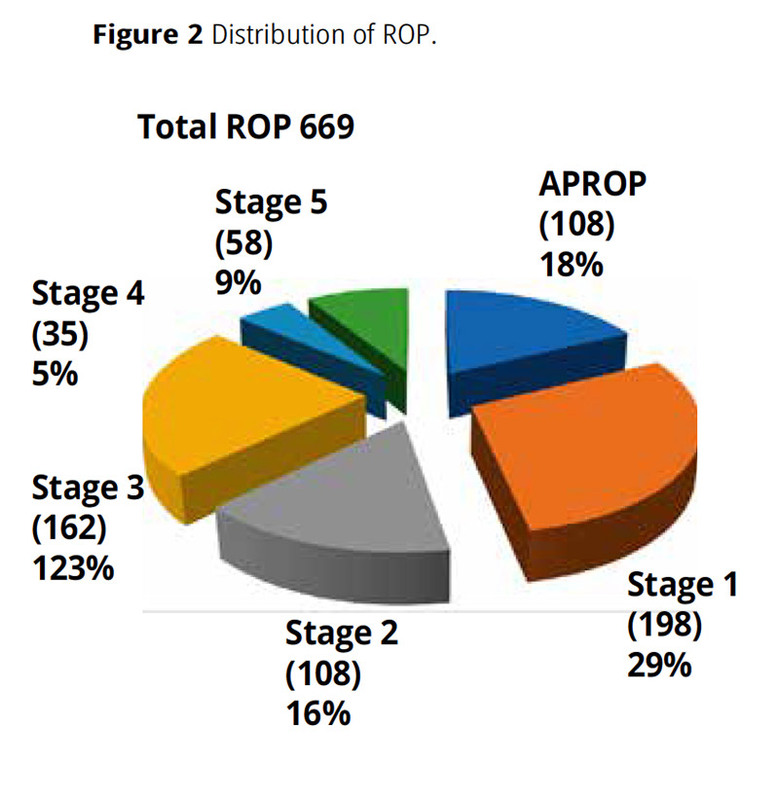 Stages 1 and 2 constituted 45% of the ROP cases, stage 3 was 23%, stage 4 was 5% and stage 5 was 9%. Aggressive posterior ROP occurred in 18% of all ROP cases seen at this center (Figure 2). During this period, 274 babies have been treated with laser, 69 with intraocular bevacizumab injection and 53 babies have had ROP surgery for stage 4 or 5 ROP. Five centers have equipment for laser treatment and two centers offer ROP surgical services. All these centers are located in Dhaka and are either private or NGO driven. The only RetCam in Bangladesh is in IIEI&H. Lack of adequate trained human resources, infrastructure and equipment are major challenges. Level of awareness is still low, especially outside Dhaka. A greater level of participation from the government, better coordination between the existing centers and increased awareness of the condition, especially about the appropriate time of referral are the need of the hour.